Description: Contains exclusive skins & the 'Legal Action Pending' DLC. This is a list of VGCollect users who have Agents of Mayhem - Day One Edition in their Collection. This is a list of VGCollect users who have Agents of Mayhem - Day One Edition in their Sell List. 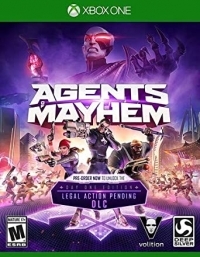 This is a list of VGCollect users who have Agents of Mayhem - Day One Edition in their Wish List.